The artist's concept depicts Kepler-69c, a planet 1.7 times the size of Earth that orbits in the habitable zone of a star like our sun, located about 2,700 light-years from Earth in the constellation Cygnus. In part seven of this "Hunting for Alien Worlds" series, the audience asks questions and makes comments about exoplanet missions and development. Specifically, we haven't pushed it past the low-mass planets that we're finding with transit and RV techniques, but maybe it offers a different regional or parameter space. Soon we'll be discovering, I think we’ll be imaging these disks, during the epoch of planet formation and getting compositional information. I was just wondering how you guys think that will fit into this picture in terms of priorities? Eric Ford: I'm glad I get to be the optimist for once. I am actually really excited about that because so far, a lot of the astronomy is focused on these short-period planets. And we say maybe we can reach out to one-year orbital periods. And maybe with RVs for larger planets, several AUs [astronomical units; 1 AU is the Earth-sun distance, about 93 million miles, or 150 million kilometers]. But we haven't focused close in. Yet there is this whole other regime of things from 10 to 100 AU that we're just barely beginning to learn about. And I think direct imaging will provide a very complimentary set of information about the larger planets, at cooler separations. But in terms of our picture of planet formation, and trying to understand what happened in all these planetary systems, how common is it to form Earth-like planets? Do they form in situ at these close locations? Did they migrate throughout their disks? What were the possibilities for them to acquire volatiles? Sara Seager: I agree. In terms of where planets come from and when they're formed in relation to the debris disks that you see, it's going to be phenomenal. So we hope that you, if that's what you’re doing, will actually find some really great things for us. And I just wanted to be pessimistic again. Not for you, but because there is a misconception of, Why can't we just do better things from the ground? And actually the part we haven't mentioned yet is the atmosphere is really bad, we don't like it at all. Even though we want to find one like that. Sara Seager: Yeah, we want to breathe it, that's a problem. The best analogy is like when you are swimming in a pool, you look up and you can never see anything really clearly. And adaptive optics is a great way to try and get rid of that, to decode what the atmosphere is doing. But I just wanted you to know that the reason we can't reach Earths is because we don't have enough information to decode the atmosphere. And that really is in the form of a bright star. You need an extremely bright star in order to get enough information going through the atmosphere to know what the atmosphere is doing. Now you could imagine a laser, because there are laser guide stars, generating a really bright star on your own, but the cost of generating a star bright enough would probably be like the cost to put a space mission up to begin with. So we don't think it can reach Earths, but in terms of the waves of new exoplanet science, I believe that direct imaging is the next wave. And we're actually going to wait to see what it can help us understand about planet formation. Eric Ford: And also, even if you could find some technology to overcome the variables of doing great adaptive optics, you still have the issue the atmosphere has a lot of water, carbon dioxide. And so it would be very difficult to get the sort of life signatures that you'd be looking for and disambiguate with the Earth's atmosphere. It’s not really clear what the connection would be to understanding a population of exoplanets and what their internal structure is, versus just wanting to learn about planets for the sake of understanding fundamentals. Audience: But if Juno is going to understand the formation and evolution of Jupiter, if you're doing a lot of complex modeling of exoplanets, is that going to improve the models and help when you are doing more theoretical modeling? David Grinspoon: In an indirect way of course. Any understanding of planets — and you know Juno is going to help us hopefully understand magnetic fields and how dynamos generate magnetic fields more. And that relates to atmospheric evolution. And so it’s all related. This is astrobiology; we're all one. But as far as you know, I think, the reason why there was that silence is that it’s in that indirect sense. I don't think that exoplanet people are thinking of that as really a mission that very directly helps them. Sara Seager: Right, it won't help us directly, but indirectly in terms understanding models of our biggest planet, our biggest sign post — it will be useful that way. But it doesn't have a direct connection, unfortunately. Audience: Shawn Domagal-Goldman, I am currently a postdoc at NASA headquarters, but soon moving to Goddard. I want to address something that David actually brought up earlier, which is his question on, How do we divide and conquer these Decadal Surveys? And I think the answer is, however they end up being divided, wherever exoplanets sit, the onus is on this community to get involved. So if you’re sitting in the audience and saying, 'Gosh, the astrophysicists really screwed that one up, I wished they'd gone and done more exoplanet research, recommended more, so I could get my hands on some more exoplanet data' — well, the next time the Decadal comes around, wherever exoplanets are sitting, whether it's planetary... I don't think it’ll be heliophysics. If it’s in planetary astrophysics, wherever it is, get involved. As a community, we've been very good about getting involved with Mars, with Venus, with other planets in our solar system. And other objects in our solar system for the planetary Decadal. And I think we need to start doing it for the astrophysics. It doesn't have to just exoplanets, either. It can be all the other things that affect habitability that we think about and study. Make your voice heard on both of those Decadal surveys. That's just the point I wanted to make. Sara Seager: Are you talking about habitable planets, or in any atmospheres? Lucy Ziurys: Let's just say any atmospheres just to start with. Then you can go to habitable. Sara Seager: Are you asking anything about the current state of exoplanet atmosphere molecules identification? Or was it just a general-interest question? Vikki Meadows: Well, JWST will be the only thing that can do a habitable Earth-like planet or super-Earth-like planet in the habitable zone. Sara Seager: Well, I don't know. I mean, the best example now — let’s leave the hot Jupiters aside. There's this planet GJ 1214b, which is kind of a mini-Neptune. Some people call it a super-Earth, whatever. But in that case, things have really been happening from the ground. Although it’s only one object for now. As we speak, pretty much anyone with any big ground-based telescope is trying to look at this thing. And in terms of spectral resolution, they just clued in to the fact that one or two transits won't cut it. And they need like 10 or 15; they could really make progress in identifying molecules. Now, which molecules? Water is a good one to think about because water is very spectroscopically active and it’s ubiquitous. The other ones that have been mentioned are maybe methane. The spectral resolution may be, I don't know, 20. Sara Seager: Yeah. People are trying to do spectrophotometry. So it's sort of a more in-depth discussion, but I think it will be really great from what we can do from the ground on bright objects. 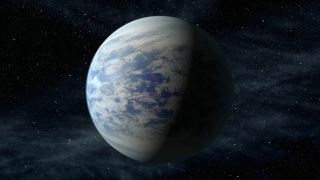 We just need more super-Earths to be discovered that we can actually observe.